To clean up your Windows 7 User profiles you have to follow the steps explained here. Delete your Temporary Internet Files and Temp Files. For this you can use Disk Cleanup (press Windows start button and type “Disk Cleanup”). If you can see in this instance the windows 7 temp files were taking roughly 100 GB. That is a lot, however given the purposes for which this computer was being used it is acceptable. Disk Cleanup could not delete the entire 100 GB of the drive because some of the data was locked by the Operating System’s running services (run services.msc to see more). Disk cleanup can delete The temporary internet files on windows 7 as well. Just scroll up and down and select the check marks next to the items you want to clean up your user profile. If you want to clean up your user profile manually you have to know where all these folders are. The Windows 7 temp files are located here: C:\Users\YourUserName\AppData\Local\Temp. The temp folder is a hidden folder. The Windows 7 Temporary Internet Files can be found at this location: C:\Users\YourUserName\AppData\Local\Temp\Temporary Internet Files\Content.IE5. You can copy and paste but change the “YourUserName” with the actual user name on your machine/computer and run the path from the The Run Dialog Window. 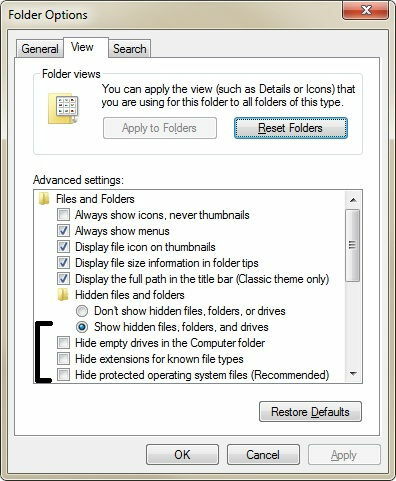 To view the Windows 7 temporary Internet Files you need to change the hidden settings from Folder Options. 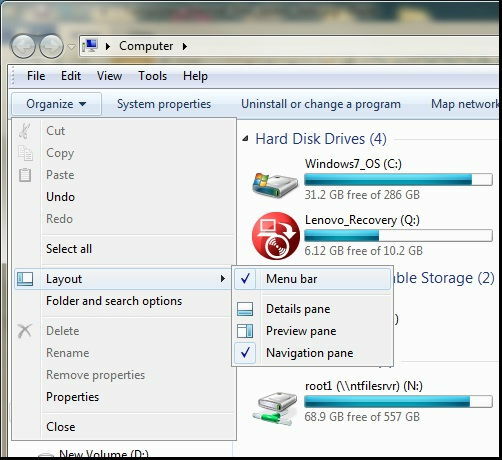 To do this open any folder (Windows Start Button -> Documents or Windows Start Button – Computer) and on the top left click the organize button hover over the pop up menu to the Layout Section and click on the “Menu Bar“. Now click on the Tools-> Options and select Show hidden files, folders, and drives. If you want you can also deselect the check marks on the other three options below it. After you have set Windows Explorer to show hidden files you can view where the Windows 7 Temporary Internet Files are and you can delete them manually from inside of the Content.IE5 folder. Just a small tip. If your files and folders disappear from your desktop and mostly everywhere on your computer. Then you can use the same method to view them. This also means that your computer is infected with some malware. 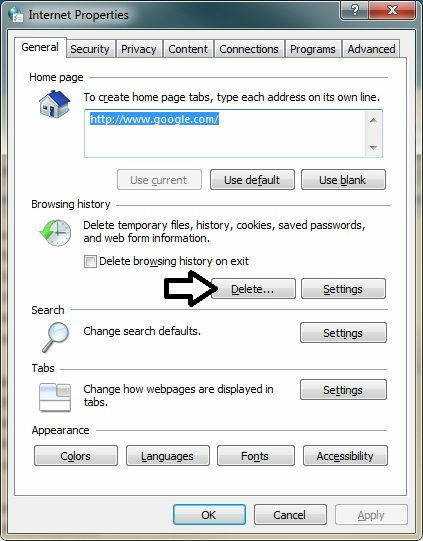 If you just want to delete your Temporary Internet files on Windows 7 you can use the Internet Options and under the general tab press the delete button in the browsing history area. Just click the delete button and follow trough to the next window. Here select from the pop up window what you want to delete. I suggest keeping the history because it is automatically deleted every 20 days and it is useful to find a website back if you forgot its name. History I always keep history, you never know when you want to go back and you just can’t remember the website, That why history is very good. Form Data This is the data which you fill out like you address phone number email and so on. 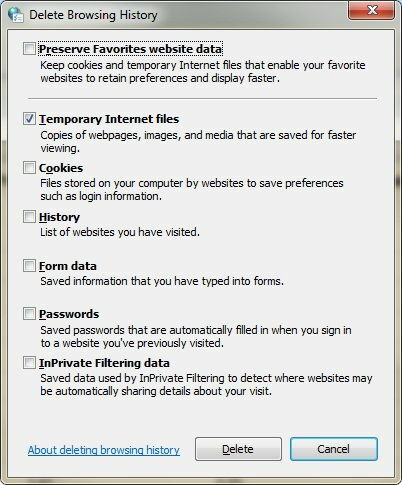 InPrivate Filtering Data This Feature is Connected with InPrivate Browsing feature where no information should be saved from your browsing session if you want to be completely anonymous. So if you use the InPrivate feature then delete the data. 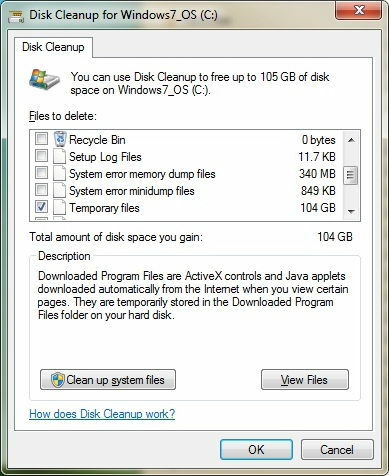 You need to remember that Disk Cleanup doesn’t clean up all users profiles, It only cleans up one windows 7 user profile. Disk cleanup performs a single user profile cleanup. To manually delete the Windows 7 temp files and temporary internet files we have to know their locations. These folders are hidden, so we have to un-hide the hidden folders and files. That’s how you perform a clean up on Windows 7 User profiles.